Happy Halloween everyone! Here are some images taken last weekend at the Keene, NH annual Pumpkin Festival. They didn't break the record this year (for the most lit jack-o-lanterns in one place), but it was still a lot of fun. As usual, there were lots of people, lots of yummy food, and, of course, lots of pumpkins. My sisters and I contributed these three jack-o-lanterns. 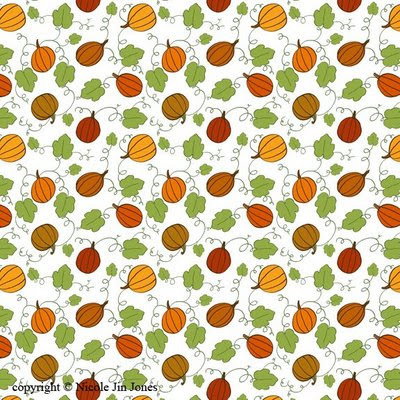 Here's a little pumpkin pattern I've finished recently. It reminds me a little of the Charlie Brown "Great Pumpkin" cartoon. With Halloween season ending, pretty soon I'll be gearing up for Thanksgiving, and I just love to bake pies. As sort of a little warm-up, I recently baked these cranberry tarts. I thought they turned out kind of cute. I've included a recipe below. Enjoy! Directions: Bring the water, cranberries, orange zest and juice to a boil. Lower the heat and add the dry ingredients. Cook until thick. Remove from the heat and cool. Prepare tops and bottoms of your pastry into whatever shapes you like for tarts (or make one whole pie if you like), and place the filling. I cut out circles from my pastry and put a couple spoonfuls on each of the bottom circles and topped with another circle for the tops, pinching the edges together to seal. Make sure there is a vent hole cut on the top crusts. I also like to brush my crust with egg white and sprinkle with a little sugar. Bake at 425 degrees until golden. My small tarts only took about 25 minutes to bake, but a whole pie may take up to 35 to 40 minutes. Thanks for posting the recipe for the tarts. Now...if I could only make them look as good as yours..:( I'm a good tester though...anytime!! !lol.